Whether you are just beginning or have been working with glass for years, we have a class for you! Join us for Beginner or Advanced courses in the copper foil method on Mondays, or Lead class on Saturdays. All Whittemore-Durgin students receive a 10% student discount on all items in our store. In addition, each week a special store discount will be offered exclusively for students. You can easily cover the cost of your course with the money saved with these discounts. Learn the history of leadworking, how to use the tools, and how to design and construct a window using lead came. 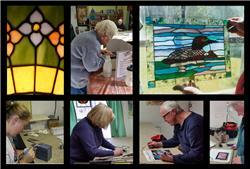 (Not a beginner stained glass course; requires prior experience in glass cutting and soldering!!) This 2-hour class session is 8 weeks long, and scheduled for Saturday mornings beginning April 13, from 10:00 a.m. to 12 noon. Only $160.